The Chamber is not a division of the U.S. or State Chamber, or a part of any government. The Chamber is a volunteer organization, owned by the membership, governed by a board of directors, and managed by a paid staff. In fact, 85% of the membership is comprised of businesses with 35 or fewer employees. The Chamber exists to build a better Bay, and strives to create value for its members and help businesses grow. Over the years, the Bay County Chamber of Commerce has worked tirelessly to “build a better Bay” through countless projects that have made a positive impact on the community. Infrastructure Surtax – In 2016, the Chamber petitioned for a new tax to fund infrastructure improvement projects in Bay County. With this campaign, the Chamber formed its first official political committee to run the campaign. Today, Bay County has over $20M annually to spend on infrastructure upgrades for things such as water and sewer lines, sidewalks, roads and more. Each municipality receives its prorated share based on population and improvements are being seen throughout the area. Panama City Bed Tax – The Chamber, once again, ran a campaign for a Bed Tax to be implemented for the City of Panama City. After unsuccessful attempts by other groups, the Chamber convinced the city commission to place the issue on the ballot. After many months of campaigning, the voters approved the new tax. Now, Panama City has over $1.5 million being generated by individuals staying in hotels to promote itself as a tourism destination just like Panama City Beach and Mexico Beach. Back Beach Road – In the late ‘80s early ‘90s, the Chamber formed a fourteen-member coalition to agree on the county’s top three transportation priorities county-wide to present to the Department of Transportation. Topping the list was the four-laning of Back Beach Road. Sending a unified message to DOT was powerful and, as a result, the four-laned highway was completed. This organization is now assisting city and county officials in the pursuit of funding for a Back Back Beach roadway. BRAC Threat to NSA-PC – During the first round of Base Realignment and Closure (BRAC) by the federal government, Bay County’s Navy Base, currently known as Naval Support Activity – Panama City (NSA-PC), was listed as a base to be closed. The Chamber formed a group of interested Chamber and community leaders to organize itself to fight off the closure. Many individuals played a vital role, testifying before congress, public hearings and more. As a result, the base was removed from the list—an act which rarely occurs. 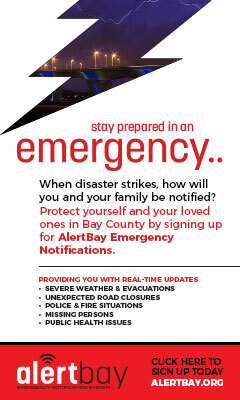 In turn, the Chamber saw the need to set up a separate organization to continuously monitor the status of our bases and look for additional missions to secure each base’s future in Bay County. Hence the Bay Defense Alliance was stood up as a separate 501(c)6 organization with the Chamber and Military Affairs Committee maintaining a voting position on the board. 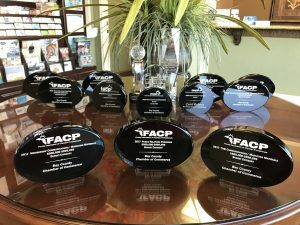 The Bay County Chamber of Commerce has won multiple awards from the Florida Association of Chamber Professionals (FACP), an organization which sets the highest standard for Chambers of Commerce in the State of Florida, for its involvement in the community. In the last 10 years, the Bay County Chamber has won 12 Communication Awards for publications and campaigns produced including the Bay Biz Magazine, Guide to Membership Opportunities, Guide to Discovering Bay County, the Infrastructure Surtax Campaign and more. The Chamber has also won “Chamber of the Year” in 2004, 2010 and 2016. Finally, the Chamber’s President and CEO, Carol Roberts, has personally won “Professional of the Year” in 2009 was honored for her 40 year career with the Organization by the FACP in 2017.